I think that also the one equipped in Valjoux 7733-7734 would fit best, is the n° 8270 in valjoux 7733-7734-7736 parts list. Thank you, hope to find, you can contact me also on MSN and Skype, addresses are in my profile. 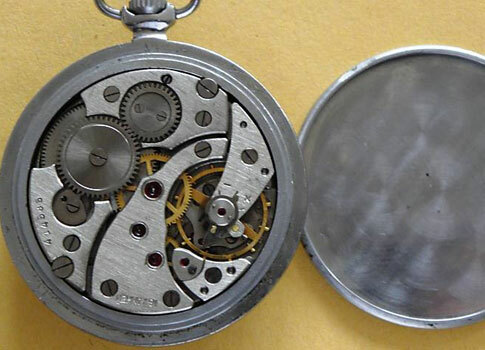 I am looking for a dial for my amphibia tonneau case which houses a 2209 movement. I know it is very hard to find but if anyone with a spare dial can send me a message. "High thoughts must have high language." I need original crystal for strela. I found a neat Komandirskie at a flea market in Budapest and I was looking to see if anyone would be willing to spare a bezel for it (so that I could actually wear it!) I would surely be willing to pay for shipping and maybe a little extra for your time as well! 1. One is the famous green football Automatic Chaika-Poljot with the elipse axis horizontal to the lugs. The acrylic crystal was replaced by a real glass crystal. 2.Second is an older one, the simple mechanical oval chaika with the ellipse axis vertical to the lugs (standing elipse). This one has been replaced by acrylic crystal. I had two watches of each one type with broken glass and after a year of effort I have been able to find someone who does ellipse (and square) crystals. if you have same watches and y are interested I can order and send to you. Do you still have your source for the oval crystals? If so does the chaika use the same crystal as the oval poljot "stadium" I have two of these watches on the way, one that a member here so graciously gave me and one from ebay that I took a chance on. Any how I am going to have at least one restored if not both, both need the crystal replaced. If you still have a source and they would work with the Poljot I would greatly appreciate your help. Feel free to pm me. If there is anyone else out there that can help with sourcing a couple crystals for these feel free to contact me also!!! Last edited by SpaCityHustler; July 15th, 2010 at 15:09. Last edited by bluedogone; July 19th, 2010 at 11:59. I'm looking for a gasket fitting a Poljot Stadium case, to replace the damaged one in the picture. Also, this one has rusty hands, so if anyone has similar spare hands it would be appreciated. Searching for two well-working Molnija 3602 balance wheels (complete with hairspring and balance bridge).